How long will your dog sit or lay down? Just wondering whats possible. I'm daydreaming of time when I can tell my dog "down" and it doesn't matter what happens around us, he'll just lay down relaxed until I tell him otherwise. Like the service dog I saw in the airport the other day. 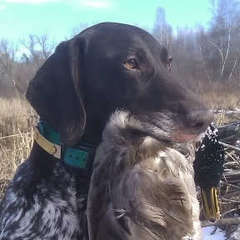 Can you get anything close to that level of obedience with a one year old bird dog puppy? how long can you have a young child sit still? how long can you have and old man sit still? You can train a lot however you have to have expectations related to the specific individual than a generalization. Just as you may have a child with ADD or not the expectations would be completely different. So what do you have for a dog (breed/age), what are your expectations of him and how long will he actually lay down? Have setters 2 year old male, 5 year old female. Male will sit/lay less than her. My expectation.... as long as they can. 1 year old drahthaar at grandmas house. Dogs are not really welcome in her house,I just don’t listen and I’m an obvious favorite. But he would never be allowed in again if he got on furniture or jumped on her. I was in and out of the room for about 1 hour while I was cooking. Other than his head he never moved. And I never had to remind him either. Good enough for me. But it took a lot to ge him there. And I work him every day on sit,whoa,and lay down. That's awesome. I need to step up the whoa training maybe that will help. But specifically, how did you "work" him on lay down? Right now I tell Wes "down" and 85% of the time he does it, 10% of the time I get a delayed response, and 5% of the time he has to see me reach for the zapper or otherwise threaten before he does it. He responds to the voice command and a hand signal so he knows full well what I want. When he's "down", if its a semi-distract-full environment, like we're in the living room and he can see my wife in the kitchen at the refrigerator or he can hear my kids in another room, then I would say I have to correct him by giving the command again or a low level nick every five or ten minutes or so. As soon as my attention slips (like going back to watching TV) then he bolts to the other room and I have to call him back, tell him down and start all over again, repeat several times before I get sick of it (and everyone else in the house gets sick of listening to me) and I put him in his crate. So the question that was in the back of my mind is that do I just have to live with correcting him every minute until he's out of this "puppy" phase? Or is he just stubborn and this is the way its always going to be, endless correction needed for every command for as long as I have him? Or does he need a period of "shock and awe" for every infraction to get it through his head that I'm not into playing give and take games, or will that just make him resent me and want to defy me more or is that what it will take to get some respect? I have to step up the obedience game because while Wes has made real improvement in the last month (like night and day as far as being civil in the house; my wife and daughter are so thrilled to finally be able to pet him a bit without getting mauled), yesterday we were in the woods and bumped into a guy with a female GSP just a couple months older than Wes. After letting the dogs run around for a couple minutes, we called them in and his dog layed down next to him nice and relaxed. His dog had been cooped up all week. Wes and I just finished 4 miles of brush busting. 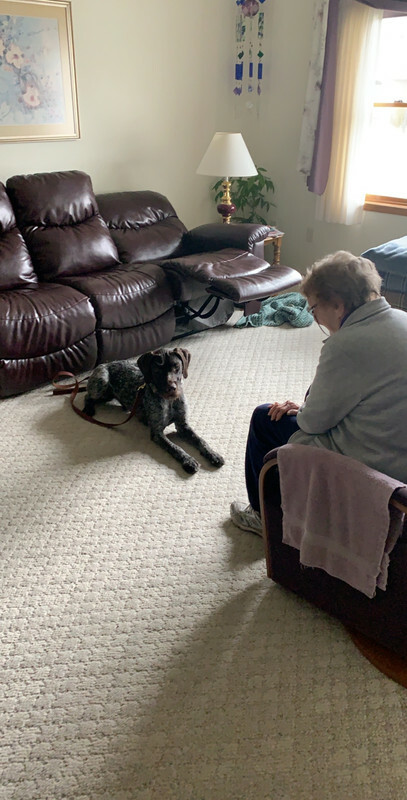 Wes layed down after a zap, and rather than lay quietly like the GSP, he barked and whined and did a belly crawl toward the GSP. I kept dragging him back and making him stay, he broke hard once and I had to pull him away and roughly force him down and use a high level zap to get him to stay. It was quite a contrast between the two dogs. I know others on here will say it's 100% me, but I had a GSP (as well as other house dogs) that behaved just like this guys at a similar age, so I've already proved I can train a dog, I'm just having trouble with this dog. Granted, this guy is an accomplished trainer involved with NAVHDA and other bird dog organizations and his dog has had lots of exposure to other dogs, which Wes hasn't). I'm also wondering how much the boy/girl thing played into Wes' behavior. This is my first male dog and don't really know what to expect. I feel like I'm being as consistent as possible with my own limited attention span, and my family (who are all pretty "soft" and might not be the best judges) are horrified at how forceful I've been with the dog so I'm not sure if lack of harshness is the issue. Am I missing technique? Lots of folks on here will say I'm expecting too much, but look at you, you have the the same breed dog doing just what he should, just what I want, just what I've been able to do with other dogs. So I don't think I'm expecting too much. Right now there's no way I could leave Wes unattended in a room with an old woman or a child, he'd hurt them. 100% certain he'd jump on them and they'd be scratched at best if not knocked down and injured if I left the room for more than a minute or two. I’m not any sort of expert but yes you have to correct a drahthaar throughout their life. They settle down as they get older but they still have a high gear inside them. I make him whoa,sit,and lay down on every walk we go on and if he moves he gets physically placed back there. No hitting or shocking him. Just a quick and harsh reset. Only time I use a collar is when he fails to come and it’s not possible to run him down. But I haven’t ran either of my dogs with a collar lately. I can’t imagine shocking a dog in the house but a lot of guys do I guess. The best long "Down" dog I had was a Schutzhund/protection dog. At my side on "Heel" at a full run he would "Down" mid stride and you could leave him and walk away. I expected 30/60 minutes and 100 plus yards away and out of sight. I think this dog would "down" for a couple of hours. my draht will lay down as long as she knows Im watching ready to put a foot on her neck if she moves, if my attention wanders she is up and gone and I have to chase her down and reset her. Check this guy out. He works with all breeds, very common sense. I think Wes reads UJ. I just had him out for a quick walk and he heeled well. I used the leash at first instead of just the ecollar since he hadn't been leashed lately. And right after I posted this my son came home (Wes gets real excited around him) and I made him lay down rather than greet him. And then my wife came home so now there's double the excitement, and Wes whined a bit but stayed down (with me right there next to him). Then I made him go to his "bed" in the kitchen, the spot where I want him to go and wait whenever I want him out of the way like when company comes to the door. I had to repeat the command a couple times but he stayed pretty well until I released him. As long as they can or as long as they want to? I'm hoping to get it so my dog stays as long as I want him to. What does a quick harsh reset look like? Say for example you had him lay down, and then you walked 20 yards away, and he broke and started to run toward whatever it was that got his attention, what would you do?